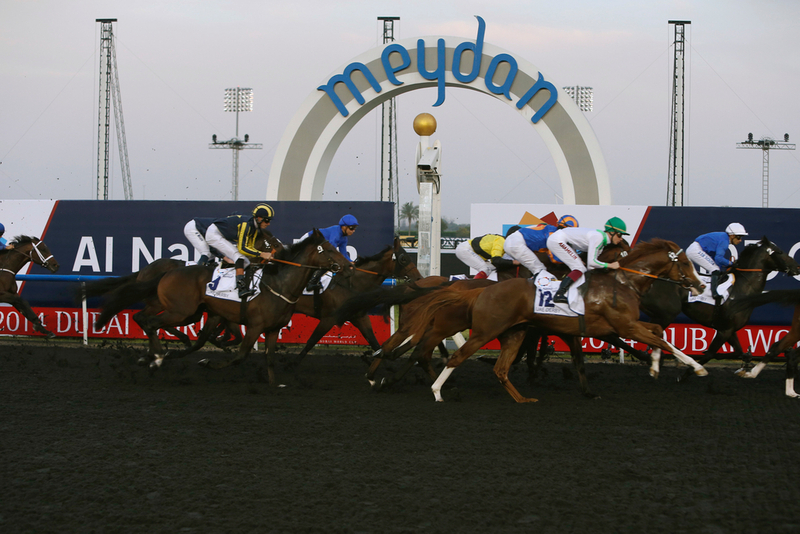 The opening race from Meydan on Thursday is the Al Naboodah Commercial Group Maiden Stakes, on the dirt over seven furlongs, where Karaginsky appears to be the most attractive for us on paper. Showed a hint of ability in sole turf start for Charlie Appleby at Newmarket last April, and looks to have good pedigree for this slower surface in the ranks. Change hands with owners and trainers, and can follow up in the footsteps of his half-brother Lavaspin, who recorded an RPR of 97 and was a winner here over six. Dubhe trials a new extended trip for the first time in the Al Naboodah Honeywell Partnership Handicap on the Turf, over the marathon distance of two miles. Unlike Karaginsky, Dubhe remains in the blue colours of Godolphin and at Charlie Appleby's Derby winning yard, and has two wins over a mile and 1m2f at Sandown in Britain. Did not show a lot of promise on his return run but was coming back after a lay-off, so more will be expected this time. Buick on board - who is two from five since returning from his ban. The unbeaten Walking Thunder can strike lightning on his counterparts in the Group Three UAE 2000 Guineas Sponsored By Al Naboodah Ashok Leyland Partnership Stakes back on the dirt. Three from three on all starts over seven-eight furlongs here for the Phoenix Ladies Syndicate, most recently winning from the widest stall from a possible thirteen, in a trial for this by nine lengths. Connor Beasley relishing his Middle-East exploits of late, and has serious chances to follow his win in these colours from last week. Ventura Knight can improve from his first start here last week in the Al Naboodah Travel Handicap under high-flying Oisin Murphy. A solid handicapper in Britain for all-time leading scorer Mark Johnston, recording victories at Ayr, Hamilton and Doncaster last term. Never better than mid-division seven days ago, but if much more prominent this time he will certainly enhance his claims to land the spoils. North America has incredibly been on the board in six times here at this venue since November 2016 from a possible ten starts, and can deliver once again in the feature of the day - the Group Two Al Maktoum Challenge R2 Sponsored By Al Naboodah Allied Products Division Stakes. Formerly with Charlie Appleby in England, before switching to Mr Seemar's yard in the Middle East. Has turned into a completely different horse, but steps up to ten furlongs again after his win over a mile almost a month ago. Won a Grade One at this distance not too long ago ahead of the well-known Thunder Snow, and can go well again. Ibn Malik has gone close twice here in the last four weeks, and can project himself back into the firing line for the penultimate race - the Al Naboodah Automotive Division Handicap. Officially rated 100, he is yet to win on this surface in Dubai, but all his recent attempts has seen him fight out the finish to some level. His recent third here reads well to Doug Watson's Drafted, and finished in the same position three days into the new year behind top duo Faatinah and Hit The Bid. Good claims and a talent sprinter. Jamie Osborne gives the Melbourne 10 Racing-owned Cliffs of Capri another chance out in the heat, after his reasonable fourth in a handicap here after a short lay-off. 20/1 with this jockey on board, he made eyecatching progress having settled in rear early on when last seen. Was running on well in closing stages and a similar performance should not see him too far away. Best form is over 7f including two Ascot Handicap wins, and Osborne is sending out plenty of runners to warm-up their legs over the cold English winter ahead of the new campaign on home soil, but only the one's that matter..